What Are Genetically Modified Organisms or GMOs? Genetically modified organisms (GMOs) and genetically engineered microorganisms (GEMs) are living organisms that have been genetically altered through techniques such as gene cloning and protein engineering. For example, it's common for bacterial genes to be introduced into cash crops to enhance their growth, nutritional value, or resistance to pests. Once a desired trait for a plant is identified, the gene for that trait is introduced into the seed for that plant. Recombinant GMOs can be produced by gene cloning methods in which a non-native gene is introduced and expressed in a new organism. The advent of PCR and gene sequencing methods have opened up the door to all sorts of manipulative techniques for changing the structure of proteins through genetic alterations to allow for proper transport within or between cells in the new host. The terms GMO and GEM are not interchangeable, though it is common in popular media for GMO to be used universally. However, GEMs are transgenic, or the result of genes being introduced in a way that could not be accomplished through traditional breeding because the species are not closely related. GMOs are cisgenic and involve genes being introduced from closely related species. The USDA reports that more than 90 percent of sugar beets, corn, and soybeans grown in the U.S. are in some way genetically modified, as of 2018. Since sugar, corn, and soybeans are among the most common ingredients in foods that are mass marketed and mass produced in the U.S., that means that most Americans are eating genetically modified foods on a regular basis. Organizations including the American Medical Association, the World Health Organization, and the National Academy of Sciences all have stated that they have found no documented cases of anyone's health being negatively impacted by GMOs, despite such organisms being present in food for decades. Nearly 90 percent of scientists from the American Association for the Advancement of Science says GMOs are "generally safe to eat." Allergenicity: While no allergic effects have been tied to GMO foods on the market, transferring genes from allergenic organisms to non-allergic organisms has the potential to inspire an allergic reaction. WHO and the Food and Agriculture Organization of the United Nations have protocols for the testing of GM foods. They also discouraged transferring genes unless the protein product of the transferred gene is demonstrably not allergenic. Gene transfer: Genes transferred from GMO foods to cells of the body or to bacteria in the gastrointestinal tract would pose a threat if those genes negatively affect human health. While the probability of transfer is low, the biggest risk comes from antibiotic resistance genes, so transfer methods that do not involve antibiotic resistance genes is encouraged. Outcrossing: This involves the migration of genes from GMO plants into conventional crops or related species in the wild or the mixing of crops derived from conventional seeds with GMO crops. This could have an indirect effect on food safety and food security since the mixing is unintentional and therefore untested. Strategies to reduce mixing include separating fields with GMO crops from fields with conventional crops. The National Bioengineered Food Disclosure Law was enacted in 2016 in the U.S. The law directs the U.S. Department of Agriculture to establish labeling standards, and as of December 2018, the process still was ongoing. Elsewhere in the world, GMO labeling is common, with more than 60 countries requiring it, including the European Union. One of the biggest sources of opposition to GMOs comes from the impact genetically modified seeds have had on farmers. Companies that develop seeds have patents on them and can sue farmers who might unknowingly grow crops using patented seeds. For example, if seeds from nearby fields find their way into an unsuspecting farmer's field, the unsuspecting farmer still can be held responsible. One of the ways plants have been genetically modified is to be more resistant to herbicides, which typically are used to kill unwanted weeds. 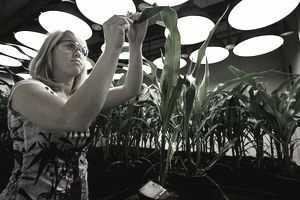 According to a 2009 study, more than 80 percent of genetically modified plants have such resistance, and the use of toxic herbicides subsequently has increased dramatically. Glyphosate is the key ingredient in the popular herbicide Roundup, and the WHO describes it as "probably carcinogenic to humans." Another impact on the environment began in the 1990s, when it was proposed that newly emerging genetic techniques could result in GEMs for bioremediation that could withstand extreme conditions and rapidly break down the recalcitrant chemicals plaguing our waste sites and brownfields. Issues such as how to control the spread of these superbugs and prevent an ecological upset have hindered their development. Numerous proposals have been put forth and tested, from programmed cell death mechanisms to bioindicators to track their spread. However, the bioremediation industry today has not been able to fully take advantage of the technology available for developing microorganisms that can quickly eliminate some of our most toxic environmental contaminants.